This is a show that delivers everything it says on the packet; a colourful, vibrant musical celebration of everything associated with the Bollywood phenomena, pleasing to the eye and leaving a feel good factor. I have to confess that I have never seen a Bollywood film. During a visit to Bombay (as it was then called) many years ago, the impression given from talking to locals was that Bollywood films tended to be very formulaic, usually very long, impressive to watch with lots of dancing and singing but with little storyline. Against that simple definition, Bring on the Bollywood was more profound whilst certainly being full of spectacular costumes, lively dancing and an impressive set. What placed the show on a higher level was all-round quality of acting and well-written script which tackled various Angel-Indian cultural issues with more gravitas than The Kumars at No 42 and a lot more colour and optimism than East is East. Bring on the Bollywood is first and foremost a love story and any East versus West cultural issues are not what the show is primarily about. With a fourteen strong cast, there are set-piece dance routines throughout the performance, much of which is powerfully physical and an array of stunning costumes. Most of the acting leads also dance and sing and the impressive two level stage is used to good effect, enhanced by excellent lighting moods. Interestingly, although all the script is in English, most of the songs are sung (as far I was aware) in Hindi, although the musical style varied considerably, often with clear Indian influences but at times sounding as if they would not have been out of place in an Andrew Lloyd-Webber musical. One song for example was sung in Hindi to just an acoustic guitar backing and a lot of the music blends Indian traditions with sounds that had heavy 80’s and 90’s western pop influences. Overall, the score is very varied and enjoyable to listen to, including at times, songs with two alternating cast members sing in English, progressing the plot although for the most part, I suspect the songs just reflect specific moods. Nisha Aaliva is impressive in the lead role as Katrina, a very Westernized Anglo-Indian returning to her family roots, bringing a light comedic touch alongside emotional turmoil. Interestingly Nisha only attended the auditions as a choreographic assistant and was discovered as the perfect heroine. Yanick Ghanty does full justice to Amit, who as Katrina’s love interest is concealing a big secret and Anthony Sahota is excellent as Katrina’s mischievous brother Lucky. For me though, one of the most memorable performances was given by Rohit Gokani as Nisha’s father Colonel Sunder Pawar, an entertaining character who could have fitted well into It ain’t half hot mum, the classic 70’s comedy series set in India just after the War. 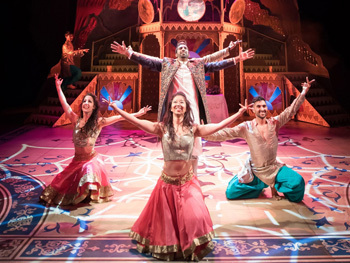 Samir Bhamra, Director of Bring on the Bollywood, has pointed to the lack of opportunities for young British Asian performers, following comments by Andrew Lloyd Webber on the lack of diversity in British Theatre. A show like Bring on the Bollywood must surely go some way to addressing that imbalance, having all the hallmarks of a big West End show and I am sure that we will be hearing a lot more of Phizzical theatre in the future. I am not qualified to say how accurately this show represents Bollywood films but Bring on the Bollywood is without question an excellent night out.